This best-selling natural multivitamin delivers food-based, potent and digestion-enhanced nutrition in just one tablet per day. Screened for vegetarians and vegans to be free of anima products. Now guaranteed AllergenSafeguard (free of gluten, soy, yeast, fish/shellfish, nuts, dairy) and with 90 million bioactive probiotics. Also free of artificial colors, flavors, sugar, sweeteners, preservatives, and other objectionable additives often found in vitamin products. 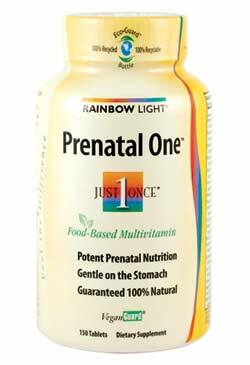 Rainbow Light Prenatal One Multivitamin provides potent vitamins and minerals in a base of superfood extracts that promote a baby’s healthy development and support your nutrition and energy in just one tablet a day. Plant-sourced enzymes, ginger juice, and probiotics support digestion and absorption for no stomach upset. Prenatal One is 100 percent natural and vegan, and is guaranteed to be free of animal ingredients throughout every stage of the production process. It is free of wheat, gluten, sugar, dairy and lactose, and yeast. It contains no artificial colors, flavors, sweeteners, preservatives, or other additives. Prenatal One contains essential nutrients in potencies that deliver optimal nourishment and protection for moms and babies throughout pregnancy and nursing, including 30 milligrams of iron to support metabolism and red blood cell production, 400 IU of vitamin D2 to promote healthy bones and teeth, plus 100 milligrams of vitamin C and 4,000 IU of vitamin A to support skin, eye, and immune health. The multivitamin also provides 800 micrograms of folic acid, which is critical for preventing birth defects and promotes healthy new cells and brain, skull, and spinal development. High-potency B-complex vitamins provide natural energy, and promote cell development and stress and immune support. A 90-milligram gentle prenatal blend provides the superfood spirulina, as well as red raspberry and ginger for nutrition and natural energy. Magnesium and potassium help naturally ease the daily discomforts of pregnancy. Custom-blended, plant-sourced enzymes plus 25 million CFU probiotics enhance digestion without taxing your system or causing stomach upset. Prenatal One is vegan–it is 100 percent free of animal products. It is also free of wheat, gluten, sugar, dairy, lactose, and yeast. It is 100 percent natural and contains no artificial colors, flavors, sweeteners, preservatives, or other additives. For comprehensive daily nutrition, protection, and energy, take one a day with or between meals. The purchase of Prenatal One supports ongoing 10:1 donations to the worldwide Vitamin Angels Maternal Health Project, which delivers life-saving nutritional support for improved birth weights and reduced mortality and morbidity rates, birth defects, and ailments caused by nutritional deficiencies. Prenatal One is packaged in 100 percent recycled, 100 percent recyclable, BPA-free EcoGuard packaging, which has a 92 percent lower carbon footprint than virgin plastic. Prenatal One Multivitamin (150 Tablets). All Rainbow Light multivitamins offer comprehensive multivitamin and mineral support.